Silicone Foam Strip Anti-pollution, anti-aging, and has excellent thermal properties of cold, is particularly applicable to high altitude, cold, damp areas. Made by extruding machine with high quality silicone rubber and inimitable sponge technique. It is good performance of high temperature resistant, aging resistant, ozone resistant, heat insulation, fuel oil resistance. It has no smell, low compression set over a wide working temperature range, good acoustic and thermal insulation properties. 70°C~300°C for intermittent use on all kinds of ironing table. 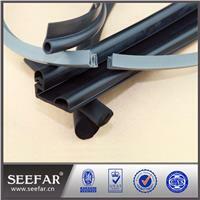 Wide operating temperature: silicone foam strip has a temperature range of 73° C to 260C. Water sealing: the closed cell structure allows for good water sealing with relatively low compressive forces. Compression set resistance: silicone offers excellent compression set resistance (ability to rebound to original thickness especially at higher temperatures, compared to most rubber material. Low compression set silicone foam strips are available for even better performance than general purpose grades. 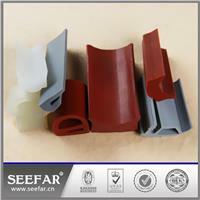 UV and ozone resistance: silicone foam strips have excellent UV and ozone resistance due in part to their inorganic backbone. This provides long term performance. 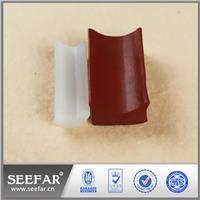 Rugged: when silicone is required, silicone foam parts are more durable than some other products openly available. Outdoor gasketing: considering all the above benefits, silicone foam strip is a good material choice for outdoor environments, from the arctic to the desert.